In a Victorian-era German asylum, seamstress Agnes Richter painstakingly stitched a mysterious autobiographical text into every inch of the jacket she created from her institutional uniform. Despite every attempt to silence them, hundreds of other psychiatric patients have managed to get their stories out, or to publish them on their own. Today, in a vibrant network of peer-advocacy groups all over the world, those with firsthand experience of emotional distress are working together to unravel the mysteries of madness and to help one another recover. 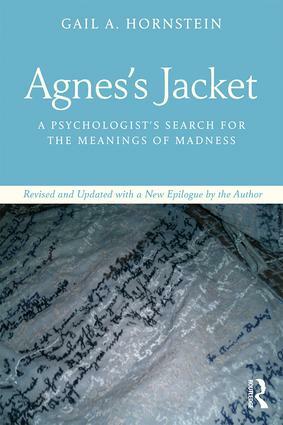 Agnes’s Jacket tells their story, focusing especially on the Hearing Voices Network (HVN), an international collaboration of professionals, people with lived experience, and their families and friends who have been working to develop an alternative approach to coping with voices, visions, and other extreme states that is empowering and useful and does not start from the assumption that such people have a chronic illness. A vast gulf exists between the way medicine explains psychiatric conditions and the experiences of those who suffer. Hornstein’s work helps us to bridge that gulf, guiding us through the inner lives of those diagnosed with schizophrenia, bipolar illness, depression, and paranoia, and emerging with nothing less than a new model for understanding one another and ourselves. Gail A. Hornstein is Professor of Psychology at Mount Holyoke College and author of To Redeem One Person Is to Redeem the World: The Life of Frieda Fromm-Reichmann. Her articles, interviews, and opinion pieces on the history and current practice of psychology, psychiatry, and psychoanalysis have appeared in many scholarly and popular publications, and she speaks widely about innovations in mental health practice across the United States, United Kingdom, and Europe. Hornstein’s Bibliography of First-Person Narratives of Madness in English (now in its fifth edition) lists more than 1,000 books by people who have written about madness from their own experience; it is used by researchers, clinicians, educators, and peer advocacy groups around the world.